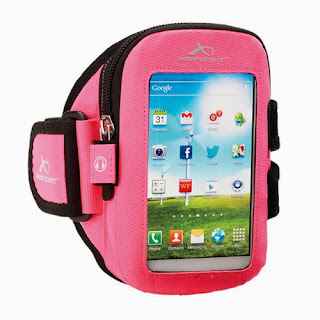 I love my Armpocket the one that I choose was the i15 sleek design this particular case holds up to 5.5 inches including the Samsung galaxy s4. I really do love mine. I had the iphone5 which fit into this sleek design and things came up where I had to get another phone. I got the windows Nokia Lumia 620 and this phone also fits perfect into this pouch. I love how you can also carry all your important cards, drivers license and so on. I don't do the gym I just walk/run around here and their but I know if I joined a gym this pouch is ideal. This pouch retails for $34.95. They come in small, medium, and large. When you want a sleek design with maximum space, choose the Armpocket i-15™. Don’t be fooled by the slim, aerodynamic look, it still fits large phones such as the Samsung Galaxy® S4, SIII or iPhone® 5/5S/5C, a thin case, credit cards, ID, and a single key. This model features 2 head-phone outlets, one on the bottom right and one on the bottom left, compatible with all phones, including iPhone 5/5S/5C. These things are so cool. I totally want to get one! I've been trying decide which one to get for the price, now I think this one is best! Thanks for the info! Love the look of that one. Could use that for the gym.